Clear Safety Glass with Etched lines. Maximum width reduction on fitting is 2mm per stile. Inform us if you require matching rail-heights with any JB Kind Doors - Doors then need to be supplied by the same door manufacturer, from the same door range. 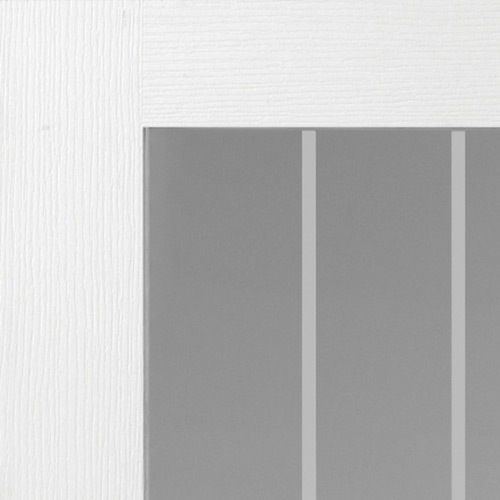 JBK Cottage 5 Glazed White Doors are manufactured from engineered door components which can include MDF, particle-board and laminated timber. JBK Glazed Cottage 5 Doors have a softwood frame, and are coated with a white primer ready to take a topcoat finish. JBK Glazed White Cottage 5 Door Codes - MCOT51L23 - MCOT51L26 - MCOT51L29 - Must be fitted and treated to JB Kind's instructions. - We cannot exchange White Glazed Cottage 5 Doors after order - JB Kind Cottage 5 Glazed White Woodgrain Doors are supplied as a Special Order. E. & O.E. see T&C - We do try to keep prices and specifi­cations Cottage 5 Glazed White Moulded Doors correct, but mistakes can be made!